Update as of 1/12/2017. 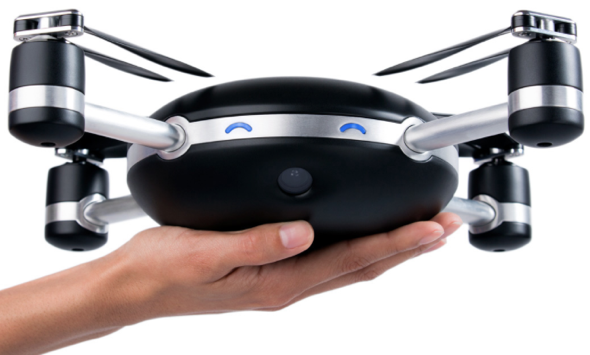 After raising nearly $34-million in funding and pre-orders the Lily Drone Project is dead. Refunds to come for those who placed pre-orders. As much fun as it is flying/controlling your own quadcopter/drone there are times when “follow me” technology is the way to go. I think that is one of the biggest downfalls of the other quadcopter in the market that don’t offer this tech, like the new DJI Phantom 3. The Lily Camera is basically built exclusively for following a tracking device that is about the size of a hockey puck (0.75″ tall x 2.37 inches diameter). You can wear the tracking device in the included waterproof carrier, put it in your pocket, or strap it on your bike. The Yily will follow (from 5ft to 100ft away with a max altitude of 50 feet) with the orientation of your choice (lead, follow, side, or loop) as long as you aren’t going over 25 miles per hour. There is no mention of Lily Cameras ability to dodge obstacles like tree branches. The user simply turns on the copter, picks settings, and throws it into the air. It does the rest. Video is shot at 1080p 60fps or 720p 120fps. You can preorder yours now for $499 now with and expected ship date of February 2016. Video of the Yily Camera after the break.